A $1,000 brain scanner. A crypto key you can’t lose. Settling new cities in Africa. This is The Frontier. The builders of tomorrow. Weird, interesting companies and research projects that will change our world. Our Pioneers are a collection of unconventional people who don’t fit into the traditional system yet have the power to completely upend it. We’re proud to invest in them, highlight them and super-charge their path to success. Fun fact before we get started: 7 out of the 10 winning teams were players in a previous tournament. Our residents seem to like living in the online city that we’ve built. A home for the creative and curious, quietly building the future. 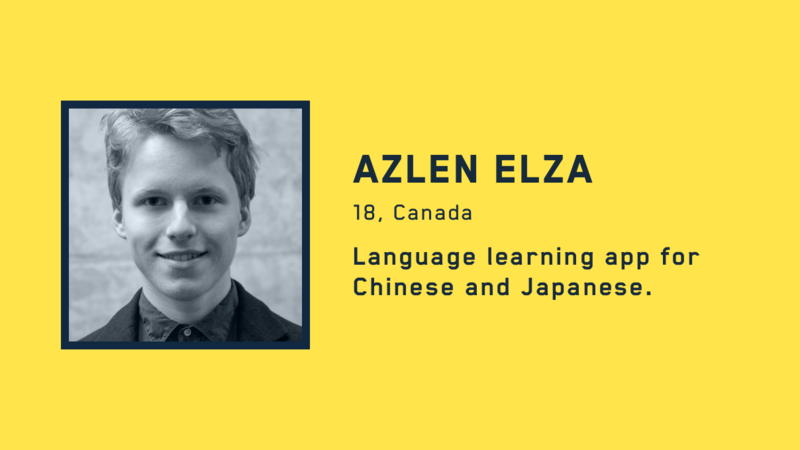 Azlen is making an app that uses new memory techniques to teach people Chinese characters at surprising speed. His project works a principle of mnemonics, connecting new information (pronunciation, tone, stroke order) to existing structures in the brain through memories or stories. Noteworthy: Azlen learned R (a programming language for data science) in elementary school. He’s only 18 and has built a ton of impressive projects, from teaching computers how to design business cards to a video game about social anxiety. 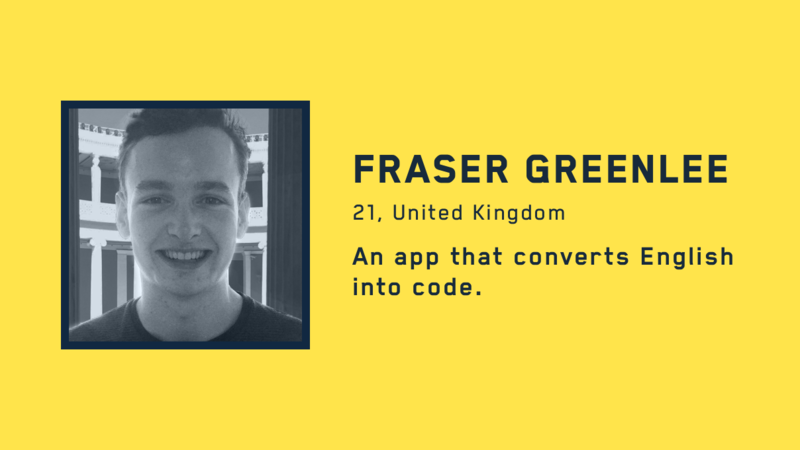 Fraser is building desc2code, an app that converts English into code. Engineers constantly task switch between writing code and finding it on sites like StackOverflow or searching Google. Fraser is connecting those worlds by letting developers specify intent and pulling in the right incantation. Accelerating the link between the human mind and the machine. It’s Occam’s Razor for Neuralink. Noteworthy: Almost everyone in the tournament that came across his work found him very productive, often exceeding his weekly goals. He’s also a tinkerer across all disciplines. Like a young Edison, he became popular in his neighborhood by making tools that made it far easier to hang and clean laundry, then giving it away to his neighbors, who were not too happy about his new found passion for code. 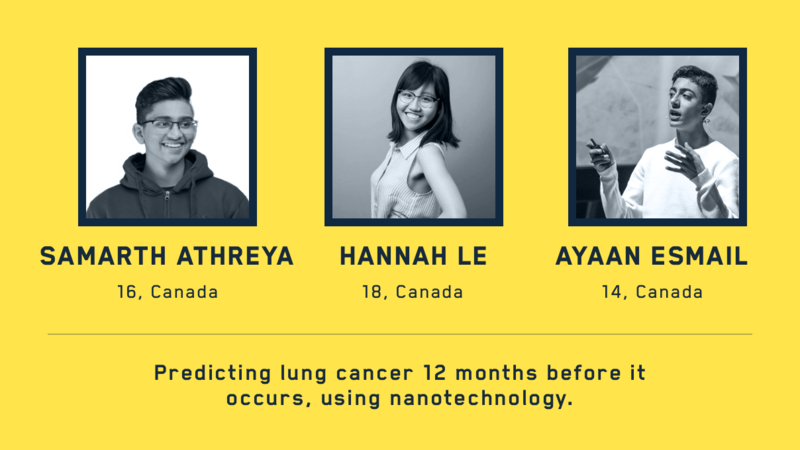 Hannah, Samarth, and Ayaan Esmail are using AI and nanotech to predict diseases like lung cancer 12 months before they occur. They plan to leverage the power of machine learning to better understand human biomarkers, in order to identify risks, diagnose and intervene well before the onset of disease symptoms. Noteworthy: Prior projects from this team include: a DNA origami icosahedron, personalized blood-clot medications, and engineered artificial ear cartilage. If you ignored their ages and focused on their output, you’d think you were reading about grad students, not teenagers. 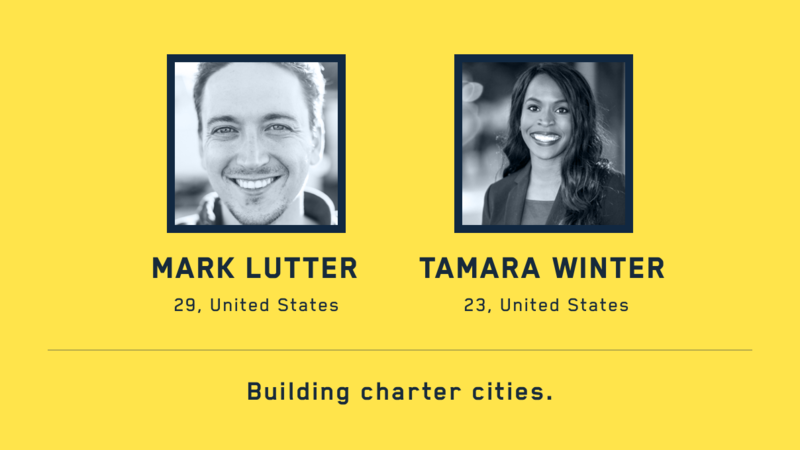 Mark and Tamara are building the ecosystem for charter cities — a concept where cities are governed by their own charter rather than general law. Imagine a world with dozens of new cities, each with their own distinct style, governance and populace. Mark and Tamara are working to make that vibrant future a reality. Noteworthy: Mark has a PhD in Economics from George Mason, but don’t let that fool you into thinking he’s conventional. He’s a disagreeable, life-long adventurer. He decided to do his own thing after realizing little progress was being made on charter cities. He moved to Honduras while it was the murder capital of the world. Now he’s stumbling through Africa looking for new city developers to work with. Noteworthy: Though only 21, this is Nick’s second company. During the last week of the tournament, Nick and Austin left their jobs at another startup to focus on Atmos. Austin is a designer and tinkerer -- he’s built everything from giant 12” steel arcs art exhibits to his own glucometer(! ), which he uses daily. Arsalan is creating AfterClass, a new kind of document editor. AfterClass helps you pull live data from your existing tools and APIs to create self-updating documents, and build custom automations for repetitive business logic. 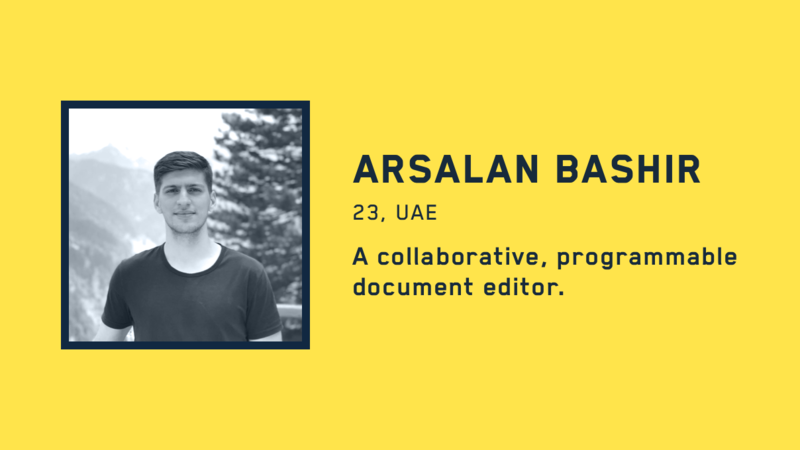 Noteworthy: Arsalan is a mechanical engineer and self-taught programmer based in Dubai. He started coding when he was 12 years old and has previously built a classroom-AI program which became the #1 app used by homeschoolers in UK. Mishka is building ThisCodeWorks.com, a place to save, share and bookmark code snippets — think GitHub Gists meets Pinterest. New forms of social networks are the type of small, seemingly-uninteresting ideas we think could get surprisingly big in time. 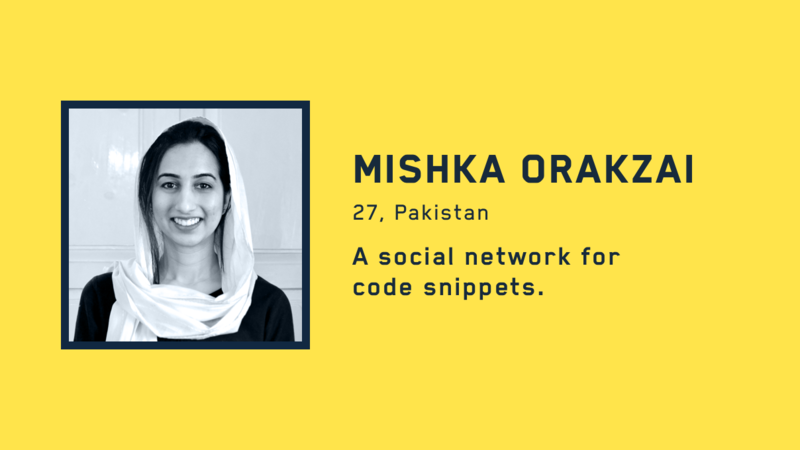 Noteworthy: Mishka is defying statistics twice: once by starting a startup in Pakistan, another by learning to code relatively later on in life. Week after week, players of the tournament were impressed with her crisp goals and consistent progress. Elena and Dusty are creating a universally accessible, borderless, and private payment system. They want to build a way for people to attain full autonomy and financial privacy when it comes to personal wealth. Noteworthy: Outside of her coding prowess, Elena has also run a side business making jewelry out of old electronics salvaged from dumpsters. She sold these pieces at women in tech events and on her Etsy store. 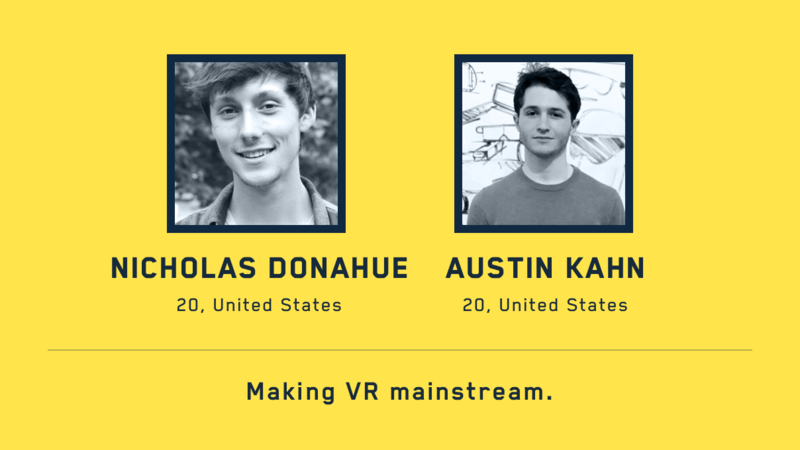 Dusty has a Master’s degree in computer science and has worked across environments as diverse as a two person start up, to the UN, to Facebook since then. 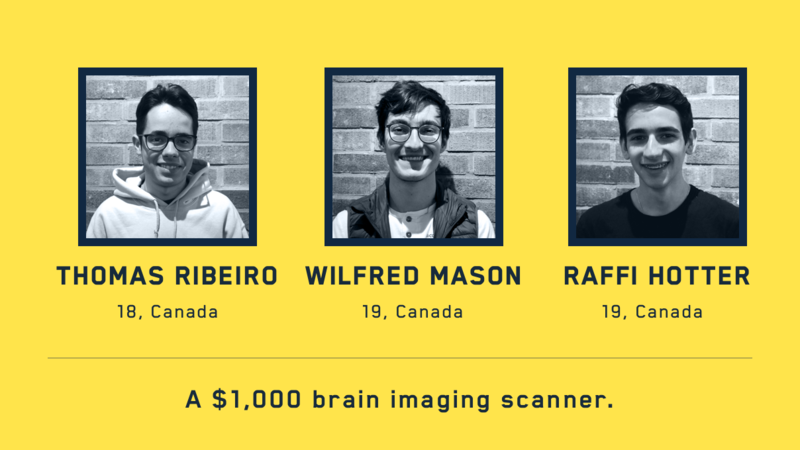 Raffi, Thomas, and Wilfred are making a $1,000 portable brain scanner. They envision a future where an instant medical diagnosis can be obtained whether a patient is in the hospital room, in field hospitals or in an ambulance. The scanner will use a portable brain-imaging helmet with photoacoustic tomography to map proteins, blood flow, and signaling molecules in the brain. Noteworthy: The team have all spent time on individual projects in medical or scientific research and been recognized on the local and international stage. Raffi has worked on brain imaging protocol to diagnose Alzheimer's Disease, and Thomas has created a small scale prototype of a power plant that generates more efficient electricity, while Wilfred has mutated and transplanted nano-metallic agents into photosynthetic bacteria. 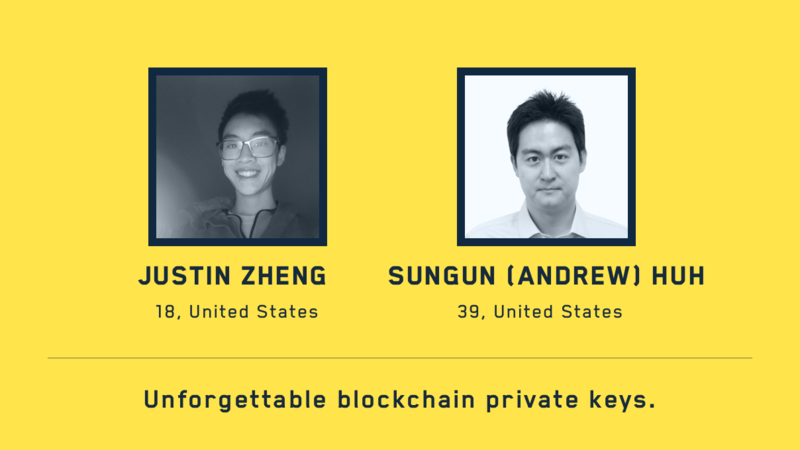 Justin and Sungun are creating a new form of a crypto private that you can't lose by applying novel biometric techniques. The idea is for the user to utilize their own body as their authentication and recovery system. Noteworthy: Justin is still completing high school, but is rapidly expanding his expertise in robotics, esports, blockchain, and encryption. Sungun has a Ph.D in Biochemistry and is a post-doc at Stanford University School of Medicine in Neurodegenerative Diseases. Have your own idea? Get $7,000 in cash and Stellar, $100,000 in Google Cloud Credits, a ticket to Silicon Valley, mentorship from experts and more. It's the perfect rocket booster for success. 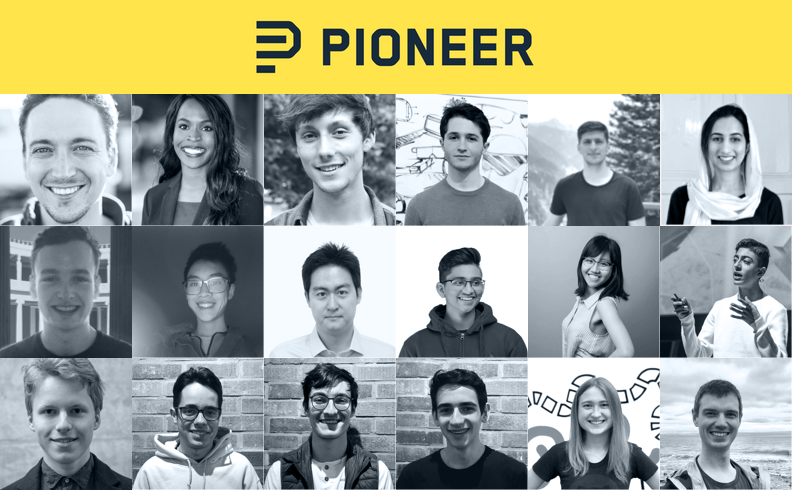 Apply to play: https://pioneer.app.